Hamstring strain rehabilitation exercises should include stretching, strengthening and sports specific exercises. Physiotherapy Consultant Neal Reynolds has devised a step by step program as might be used by professional footballers. The step by step routine is used in conjunction with healing, strengthening and maintaining aerobic fitness. As every injury is different and every athlete is different it is impossible to put timescales on when certain exercises should be done. This step by step approach means the athlete only moves onto the next stage when ready. Progress through the stretching exercises only moving onto the next level when the milestones have been reached. During the acute stage immediately following a hamstring strain injury no stretching should be done at all, only rest. How long this stage lasts for will depend on the severity or what grade the injury is but is usually 2 to 4 days. Move on to the next stretching stage when daily activities such as normal walking are pain-free. If at any time you suffer a setback then simply move back a stage or two and start again. Straight leg hamstring stretch in standing can begin. Place the foot on a table or similar and lean into the stretch keeping the leg straight and chest up. Take the stretch as far as is comfortable and hold relaxing into the stretch. Aim to stretch forward from the hip rather than the shoulders. A gentle stretch should be felt at the back of the leg but it should not be painful. Perform 3 set of 10 seconds once or twice a day. The aim is to get a little bit of elasticity to the healing tissue, not increase flexibility. This can also be done sitting down. Bent leg hamstring stretch on the back targets the muscle fibres closer to the hip whereas the straight leg hamstring stretch targets the fibres nearer the knee. Lie on your back and pull the leg over keeping the knee very slightly bent until a gentle stretch is felt at the back of the leg. Again this should not be painful. Perform 3 sets of 10 seconds once or twice a day. You are ready to move on when you have repeated the above pain-free for a minimum of 3 days. Stage 3 is similar to stage 2 but the aim is to try and get the same range of motion and flexibility in the injured leg as the noninjured leg. straight leg standing hamstring stretch should be continued as before with 3 x 10 seconds in the pain-free range once or twice a day. Likewise with the bent leg stretch on the back. 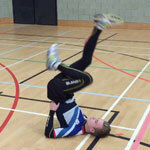 The athlete is ready to move on when both legs have similar levels of flexibility. Again the purpose of stage 2 is to get a little bit of elasticity to the healing tissue. Begin gentle dynamic stretching. Dynamic stretching involves gently swinging the leg into a stretched position. Ensure the leg is relaxed at all times and the stretch is not forced. Perform 3 x 10 reps gently swinging the straight leg as high as is comfortable. It may help to put the free hand over the swinging leg as a target and to possibly trick the brain into thinking it is safe to swing the leg. Begin active straight leg raises from lying on the floor. The athlete lifts the injured leg up as far as it will go within the pain-free range then lowers again. Perform 3 sets of 10 reps once or twice a day. Try to get a more dynamic movement with this exercise and aim to gradually straighten the knee as flexibility allows. Cycling exercise lying on the floor. The athlete lies on their back and supports their hips up in the air with their hands whilst performing a cycling action with the legs. The athlete is ready to move on when stage 4 exercises can be done for 2 days of pain-free. Stage 5 is the same as stage 4 but with the aim of working towards equal flexibility on both legs. Dynamic hamstring stretches, active stretches and cycling should all be done pain free. When both legs feel the same with equal flexibility then the athlete is ready to move onto stage 6. Dynamic walks can begin which involve the athlete walking forwards whilst kicking the straight leg up in front each step to get a dynamic stretch in the muscle. The leg swings should be controlled and not forced, always within the pain free range of motion. Perform 3 sets of 10 repetitions once a day. This exercise should be done for at least 2 days without any pain. The athlete has completed all hamstring stretching stages when this exercise and others previously done are pain free with equal flexibility in both legs. 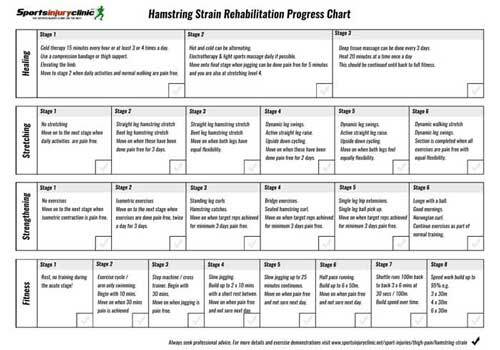 The following strengthening exercises for the rehabilitation of hamstring injuries should be done progressively as part of our hamstring strain rehab program. This is for information purposes only. We recommend seeking professional advice. Below are a number of progressively more difficult hamstring exercises. They should always be done pain free. Where you start and how fast you progress will depend on how bad your injury is and how long ago it was injured. The athlete lies on their front in the prone position. The partner or therapist provides resistance as the athlete contracts the hamstring muscles, holds for 3 or 4 seconds then relaxes. The angle of knee flexion is changed and the exercise repeated. Once a range of angles have been worked the whole process is repeated with the foot first turned first inwards then outwards. This exercise targets the inner and outer hamstring muscles at varying angles of flexion or knee bend. 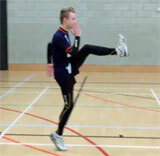 The athlete stands on one leg and bends the other one using gravity as resistance. This can be done gently and slowly to start with as an early stage exercise. Aim for 3 sets of 10 repetitions once a day building to 4 sets of 20 reps. Ankle weights can be used to increase the load further. As the athlete returns to running this exercise can be performed more explosively. The leg is allowed to fall and the hamstring muscle catches the leg before it falls to the horizontal. It may take a while to get used to this one. The athlete must stay relaxed as the leg falls under the influence of gravity and only contracts the hamstring muscles to prevent the foot landing. This starts to work the muscles eccentrically with a very light dynamic training effect. This should be done pain free both during, afterwards as well as the next day. A little bit of natural muscle soreness the following day is OK but if it is uncomfortable then take a step back. Again begin with 1 set of 10 reps and build up each day to 3 sets of 15 reps. An ankle weight can be used to increase the load on the muscle. The athlete lies on their back, knees bent and pushes the hips upwards to work the gluteual miuscles and hamstrings. Use both feet on the floor pushing up to begin with. Hold the position briefly and then lower. Begin with 3 sets of 8 reps building to 3 sets of 12 reps then progress the exercise to single leg bridges. Single leg bridges are done in the same way ensuring you squeeze the gluteal muscles and aim to maintain a straight line from the shoulder on the ground to the knee at the top point of the exercise. Again, begin with 3 x 8 reps and build up. This is a deceptively difficult exercise which works the hamstring muscles specifically in a very contracted close range of movement.One end of a resistance band is tied to a fixed point or held by a partner and the other end secured to the foot. The athlete pulls the heel into the buttocks contracting the hamstring muscle to do so. Aim for 3 sets of 8 reps to begin building up to 3 sets of 12 or 15. This is a more advanced version of a bridge. Using a step or box the athlete rests on their elbows and alternates each leg putting the heel down on the floor maintaining good core stability. It is important to keep the hips and shoulders still. As the heel touches the ground the gluteal muscles and hamstrings have to work isometrically to keep the body stable. This also works the hamstring muscles in a similar position as they are in when sprinting or accelerating. This is another deceptively difficult hamstring exercise which looks easy at first glance. However with this one it is important to judge muscle soreness the next day before over doing this one. It works the hamstring muscles in a very stretched position, particularly the muscle fibers nearer the buttocks. The athlete places on foot in front of the other and bends down to pick up the medicine ball. They then repeat the movement to put the ball back down. Repeat this 5 to 10 times. A basic lunge is performed while holding a ball to aid balance. This exercise strengthens the glutes, hamstring muscles and quadriceps muscles. The athlete stands with the injured leg a wide stance in front of the other. Holding a medicine ball close to the chest the weight is shifted onto the front leg and back knee bent dropping it down to the floor. Another deceptively difficult exercise which looks easy but checking the level of muscle soreness the next day is important before doing to many of these is important. This exercise is a more advanced version of the single leg ball pick up and works the lower back and hamstring muscles eccentrically, especially the fibers towards the top of the thigh. The athlete bends forwards at the waist keeping the back straight. This also works the hamstrings as they stretch. One of the most advanced hamstring exercises. The athlete kneels down while the therapist holds the ankles. They then slowly lean forwards as far as they can under control using the hamstrings to resist the forwards movement. A super advanced version of this is to use the hamstrings to curl back up again. Being injured doesn’t have to mean training stops. This step by step aerobic fitness program to be used when recovering from hamstring strains and is designed to be used in conjunction with a full hamstring strain rehab program consisting of healing, strengthening and stretching exercises. The athlete will only move onto the next stage if the current stage can comfortably be completed pain free. If at any time the exercises are painful then step back a stage or two. Stage 1 (acute stage): This is the painful stage immediately after injury. A couple of days rest isn’t the end of the world but any longer and and arm bike is a handy way of raising the heart rate without putting any strain on the injured hamstring muscle. An arm bike or hand bike is a piece of equipment found in some gyms where the arms are used to pedal a stationary bike. When daily activities such as walking up stairs, getting in and out of a car, for example, are pain-free then you are ready to move onto the next stage of the hamstring rehab aerobic progressions. Stage 2: Use a rowing machine if pain allows. Row at a steady pace and low resistance for 5 minutes upwards. A time of 20 minutes a day should be enough to help maintain fitness. You may find it easier to break this into 5 or 10 minutes intervals with a couple of minutes walk recovery to monitor the effect on the hamstring muscle. Stage 7: Slow jogging – up to 2 x 10 minutes with a short rest in between. Move on when the above is pain-free and pain-free the next day. Stage 8: Slow jogging – up to 25mins continuous. Move on when pain-free and pain-free the next day. Stage 9: Half pace running. 6 x 50m strides. Move on when pain-free and pain-free the next day. 100m shuttles at 30s (3 x 6mins) with short rest. 100m shuttles at 27s (3 x 6mins) with short rest. 100m shuttles at 24s (3 x 5 minutes) with longer rest. 100m shuttles at 20s (3 x 4 mins) with longer rest as required. Stage 11: (final ftage): Sprints – 8 x 50m sprints (twice). Ensure pain-free during and after.